Workman Publishing Company, 9780761189824, 496pp. Everything you need to make the wedding of your dreams come true, no matter what your vision, taste, or budget. 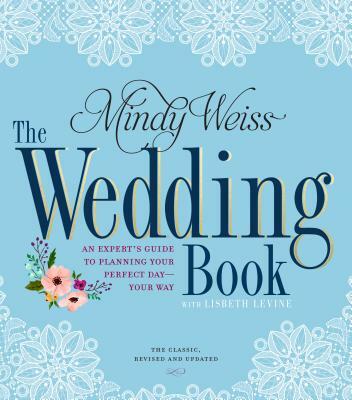 Written by Mindy Weiss, the “megastar wedding planner” (People), The Wedding Book is the most comprehensive wedding guide published, and is now revised and updated for a new generation of brides- and grooms-to-be. The Wedding Book is your fashion consultant, etiquette expert, menu planner, floral designer, and shoulder to lean on with advice if sticky family issues turn up. It’s an insider source for contract negotiation and budget-stretching tips. It explains how to get the most out of Etsy, Pinterest, Instagram, and other social apps and websites—including how to use Uber for guest transportation. Whatever the subject—cakes, stationery, video (including drones! ), lingerie, tents, insurance, port-a-potties, party favors, the toasts, looking great in photos, tipping, thank-you notes—The Wedding Book has the answer. Mindy Weiss is one of the most sought-after party planners in the country, working with celebrities including Ellen DeGeneres, Sofia Vergara, and Channing Tatum. She is regularly featured in magazines and newspapers including People, US Weekly, The New York Times, The Wall Street Journal, and The Los Angeles Times. She is also the author of The Wedding Planner and Organizer and The Baby Keepsake Book and Planner. She lives in Los Angeles and online at mindyweiss.com. Lisbeth Levine is a contributing editor for InStyle Weddings. She lives in Chicago.